The spring snow peas are fabulous in late winter! We have been enjoying them for a few weeks now. While I love stir-fried vegetables, I dislike the mess it makes on my stove. So, I experimented with steaming them, and then placing in ice water to stop the cooking process. This technique proved to be so much better as it resulted in a faster cooking time. This dish is great over rice, served with oven-roasted bone-in chicken breasts, or served with coleslaw with fresh pineapple. Stir-fry Snow Peas with Broccoli and Mushrooms recipe, comments, and photos were shared with me by Karen Calanchini, Food Stylist and Photographer, of Redding, CA. Fill a large bowl with water and ice cubes; set aside. Using a pan with a steamer basket, bring 3/4 to 1-inch of water to a boil (water should not touch bottom of steamer basket). Place the prepared broccoli stalks in the basket and place a lid on the pan. 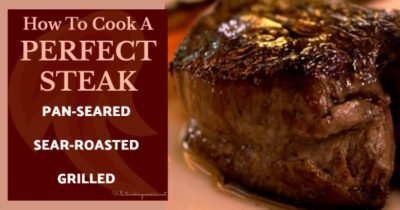 Reduce heat to medium and let steam 3 minutes. Check broccoli, if it has turned a brilliant green, remove and dunk into the bowl filled with water and ice cubes. When broccoli has cooled, lift steam basket and broccoli from the water and let drain. Wrap cooked broccoli in paper towels and roll up; set aside. Repeat the same above procedure with the snow peas, but check after 1 minute of steaming. The snow peas will turn a brilliant green and begin to sweat. If they need a bit more steaming time, place lid back on the pan and then check again in another 30 seconds. Wrap cooked snow peas in paper towels and roll up; set aside. 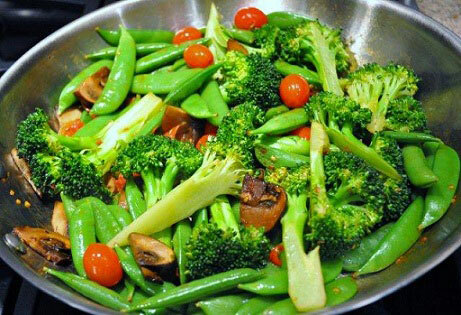 At this point, cooked and wrapped broccoli and snow peas may be placed in the refrigerator until you are ready to finish the stir fry process. In a container with a good lid, add the soy sauce, sherry wine, cornstarch, sugar, chile paste, sesame oil, and lemon zest. Shake well and set aside. Using a heavy-bottom pan over medium-high heat, add the coconut oil. When the coconut oil has melted, add the mushrooms and saute until they are a nice golden brown. Add steamed broccoli and saute another 3 minutes. Add steamed snow peas and continue to saute for an additional 3 minutes. Do a taste test (you want the veggies to be heated through but still remain crunchy). When vegetables are to you liking, toss in the grape tomatoes, giving a few tosses until the tomatoes are mixed in with the other vegetables. Add the prepared soy sauce mixture (shake again) and toss well. Taste and add a little coarse sea salt, if needed. * Coconut Oil is fatty oil or semisolid fat extracted from fresh coconut meat. It will have a fresh, clean coconut smell and taste and should be colorless. Throughout the world coconut oil is used for cooking, beauty, and healing purposes. It is solid at room temperature. You may use any cooking oils (of your choice) in this recipe, if desired.